Try pairing a tan knit open cardigan with a Stella McCartney stella logo tote from farfetch.com to create a great weekend-ready look. A pair of tan leather thong sandals will integrate smoothly within a variety of combinations. If you're all about functionality dressing when it comes to your personal style, you'll love this adorable pairing of a navy and white horizontal striped long sleeve t-shirt and a tobacco leather tote bag. And if you want to instantly up the style ante of your look with one piece, add grey suede ankle boots to the equation. 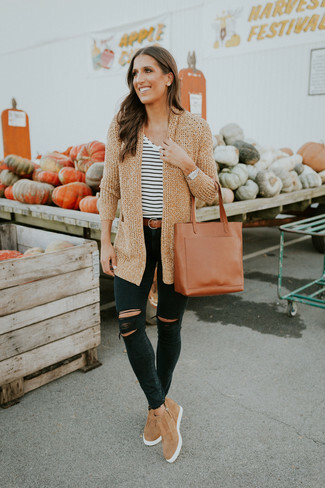 If you love staying-in clothes which are stylish enough to wear out, you should try this combination of a beige fluffy open cardigan and a tobacco leather tote bag. To add oomph to your outfit, complement with tobacco leather oxford shoes. We're all seeking comfort when it comes to dressing up, and this combination of a burgundy paisley maxi dress and a Stella McCartney stella logo tote from farfetch.com is a practical illustration of that. 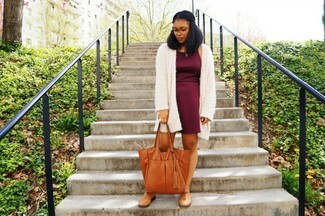 Dress up this ensemble with tan leather knee high boots. Wear a tan open cardigan and a Stella McCartney stella logo tote from farfetch.com to be both casual and cool. 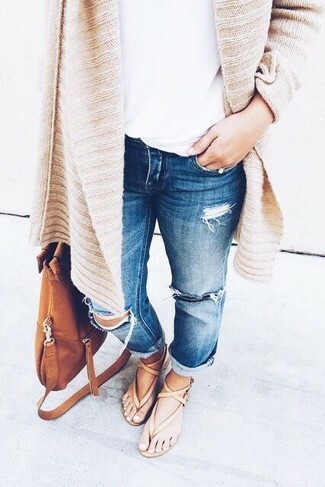 Make tan suede wedge sneakers your footwear choice to instantly up the chic factor of any outfit. Try teaming a pink vertical striped dress shirt with a Stella McCartney stella logo tote to create a great weekend-ready look. Bump up the cool of your getup by rounding it off with tobacco leather heeled sandals. If you're all about practicality dressing when it comes to your personal style, you'll love this super cute pairing of a black coat and a Stella McCartney stella logo tote. 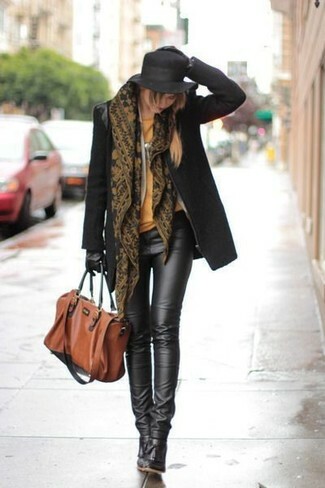 Wearing a pair of black leather ankle boots is an easy way to add extra flair to your ensemble. Go for a light blue sleeveless top and a Stella McCartney stella logo tote if you're on a mission for an outfit idea for when you want to look casually cool. Up the cool of your getup by completing it with grey leather pumps. If you're obsessed with relaxed dressing when it comes to your personal style, you'll love this totally chic pairing of a beige trenchcoat and a Stella McCartney stella logo tote from farfetch.com. Perk up your look with black suede pumps.